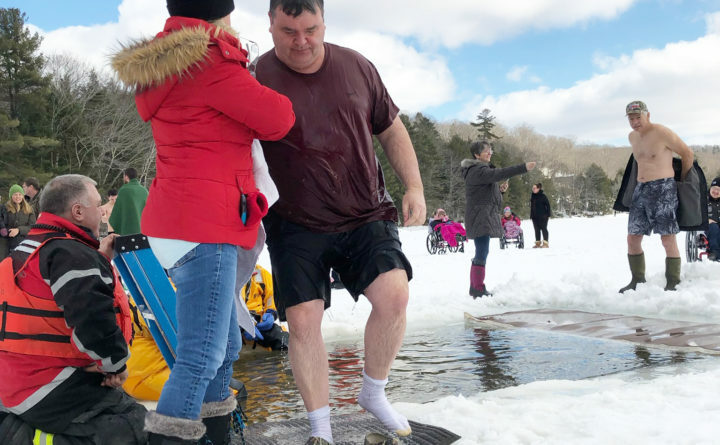 About 35 swimmers, including a member of the Camp CaPella board of directors, Jeff MacDonald (brown shirt), endured the frigid waters of Phillips Lake in Dedham on Sunday. Thirty-five very brave and cold people jumped into the frigid waters of Phillips Lake for a good cause Sunday. They all took part in a polar dip that raised about $15,000 to help campers to attend Camp CaPella, one of two Maine camps that specializes in helping children and adults with disabilities enjoy the outdoors with their families and gain greater independence, said Harvey Chesley, the camp’s facilities and development director. 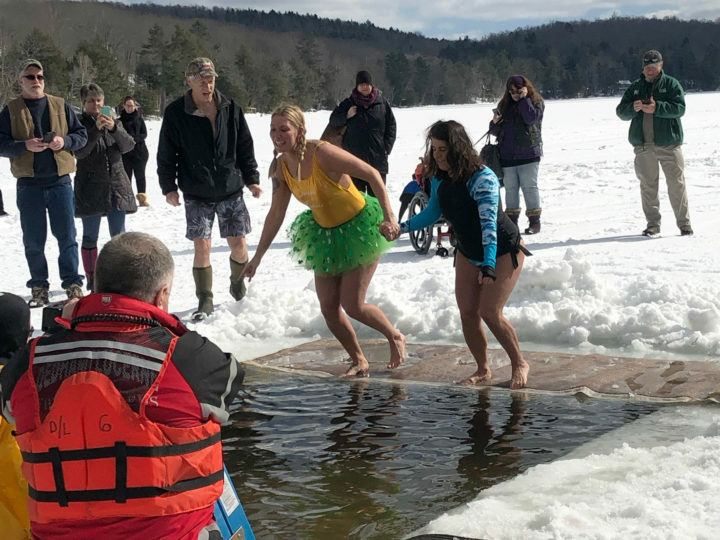 About 35 swimmers endured the frigid waters of Phillips Lake at Camp CaPella to raise money for the Dedham camp on Sunday. 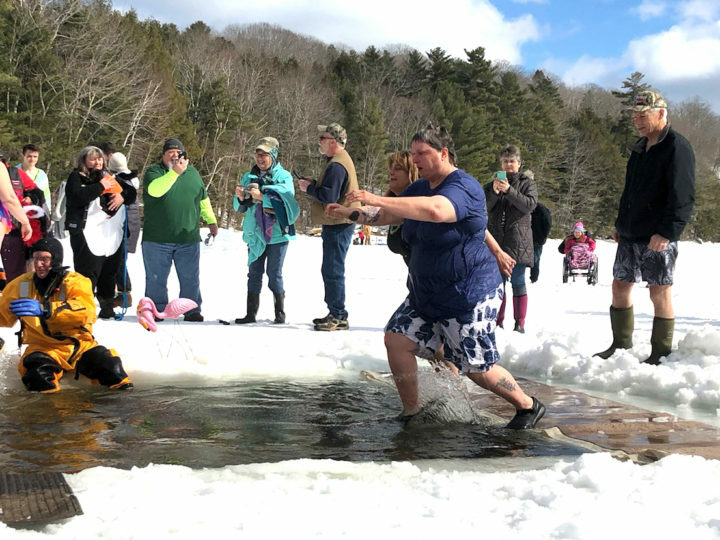 Event Coordinator Joe Dowling cut a large rectangle in the 23 inches of lake ice and firefighters stood by the ladder that led out of the water during the three-hour event. About 100 people attended. Participants wore bathing suits, fright wigs, tutus and T-shirts, and moved through the water almost continuously. Return dippers said they had never experienced water so cold, camp Director Heidi Riggs said. Those who got through the frigid water got to experience the pleasure of its opposite — a hot tub provided by Sandollar Spa & Pool of Brewer, then time in the Miller Lodge for pizza, chili, hot dogs, coffee and hot cocoa. Hall-Day Key Club, Chrome Angels motorcycle club, Home Depot of Bangor, Bangor YMCA and the Penobscot Valley 4-Wheel Drive Club were among the groups that supported the event. The $15,000 is enough to send 1o to 12 campers to the camp, which will hold seven one-week sessions this summer, Riggs said. She invited anyone interested in contributing to visit the giving guide on the camp’s webpage.